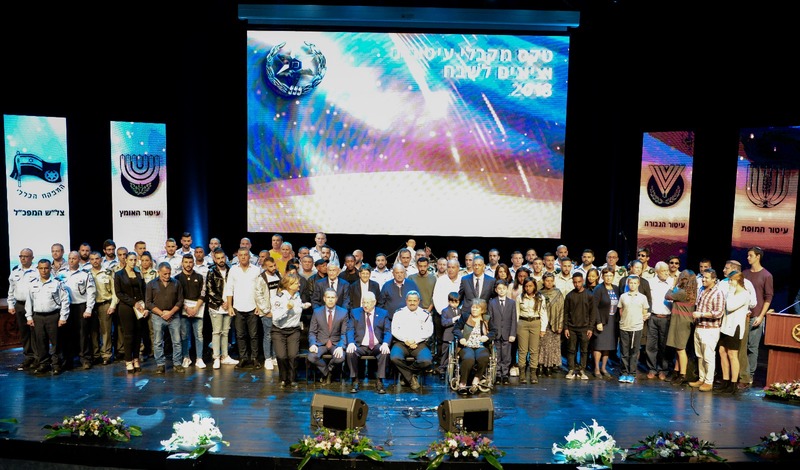 A resident of the Efrat settlement and father of four, Fuld was one of 54 people — police officers and civilians — to receive an official commendation on Tuesday night, at an event attended by Public Security Minister Gilad Erdan, outgoing Police Commissioner Roni Alsheich and President Reuven Rivlin. On September 16, Fuld was standing outside a market near the Gush Etzion Junction in the central West Bank when 17-year-old Khalil Jabarin stabbed him in the back and neck multiple times. “Ari — may his memory be blessed — turned around, faced the terrorist, saw the knife covered in his own blood and screamed: ‘Terrorist! Terrorist!’” the police said in a statement. “He pushed the terrorist back and fought with him. When the terrorist fled, despite his critical injuries, Ari chased after the terrorist with the last of his strength and managed to shoot him with his handgun before collapsing to the ground,” according to the police. In the description of the attack, the police credit Fuld with preventing additional casualties by shooting Jabarin, who had run toward an employee of the shopping center. “I am proud of these wonderful and incredible people: border guards Israel Police officers and resourceful civilians, including Ari Fuld — may God avenge his death — who fought with a despicable terrorist until his last breath. Unfortunately it is in these extraordinary incidents that we learn the most about [Fuld],” Erdan said at the award ceremony. The public security minister had last month called for the police to consider granting Fuld the award for his actions in the terror attack. Security camera footage of the shopping center shows Fuld, after having been stabbed and with blood pouring down his back, chasing and shooting at Jabarin. He then collapsed to the ground. Fuld was rushed to a Jerusalem hospital, but was declared dead shortly after. Jabarin was taken to the hospital in moderate condition and arrested. “Ari Fuld demonstrated supreme heroism and fearlessness when in his final moments he chased after the terrorist who had fatally stabbed him, neutralized him and in so doing saved the lives of other civilians,” Erdan wrote in his recommendation to Alsheich last month. Erdan, who is also the strategic affairs minister, said that Fuld had also dedicated his life to defending Israel by combating the Boycott, Divestment and Sanctions (BDS) movement. Fuld was a well-known Israel advocate and right-wing activist. His killing pierced the community of pro-Israel advocacy, and activists recalled him as a dogged supporter of the Jewish state. Read more on TimesofIsrael.com here.